This book of hours is illuminated in a style combining features typical of a group of manuscripts made in Suffolk, probably Bury St. Edmunds. Heraldry in one of the initials indicates that the manuscript was made for a member of the Hamelden family, of Holton St. Peter in Suffolk. This parish is on the outskirts of Halesworth, in an industrial estate where Bernard Matthews turkey products are made. 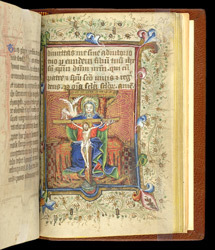 This common composition is known as a 'Gnadenstuhl' Trinity (Throne of Mercy Trinity): God the Father sits holding his son, crucified on the Cross, while the Dove of the Holy Spirit flies above.